Key Difference: The primary difference between the two is the fact that the TDS deducted on Salary is reflected in Form 16, whereas the TDS Deducted on Other Payments is reflected in Form 16A. Additionally, Form 16 is generally issued annually whereas Form 16A is issued quarterly. Taxation is confusing, which is why it seems like such a tedious task for most people. Still, it is not something that can be avoided. Hence, it is better to clarify between the confusing topics. One such topic is the Form 16. Form 16 is essential for any salaried professional. However, there is also the Form 16A. What is its purpose? Let’s find out. When a person works in an organization, they may notice that they do not get their whole salary. Parts of their salary are often deducted. While they may be deducted for a variety of reasons such as ESIC, Provident Fund (PF), etc. a major chuck of the deduction is for TDS. TDS stands for Tax deducted at Source. Everyone has to pay taxes on their earnings. However, these taxes are payable at the end of the financial year after one files taxes, which is often after March. Now instead of having to pay the tax for the whole year at one time, which can amount to a large number, the system incorporated TDS. Under TDS, the company deducts the tax for the month from the monthly salary. The company then pay this tax to the Income Tax Department on behalf of the employee. Hence, the employee does not have to bear the brunt of the taxes at one time. In order to prove that the company has deducted the TDS and paid to the Income Tax Department, thus avoiding that the employee may have to pay the taxes again, the company issues a Form 16. 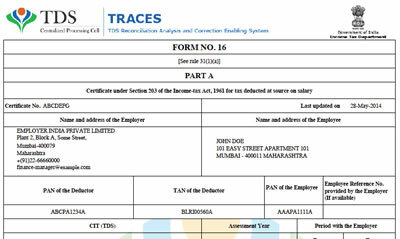 The Form 16 stands as a Salary TDS Certificate, and hence contains certain information such as employee details such as name, Permanent Account Number (PAN) etc., as well as Employer details including name, permanent account number PAN, TAN, etc., and total income and total tax deducted among other things. Form 16A, on the other hand, is another form that is quite similar to Form 16. 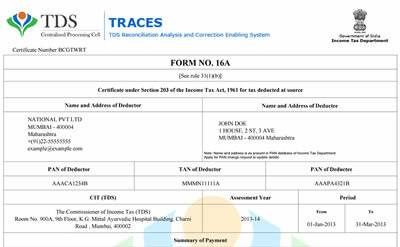 Like Form 16, Form 16A is also a TDS Tax Certificate, however it deals primarily with taxes deducted on things other than salary, such as professional fees, rent, bank interest payments, etc. For all purposes, Form 16A functions the same as Form 16, except that the person is not a salaried professional of a company. Instead, they are non-salaried employee who works as a professional for an organization. Basically, this refers to people working for proprietorships or who are working as consultants. It refers to anybody who earns money but does not draw a salary from a registered company, as defined by the Income Tax Department. While it can be confusing to tell the two apart, it should be noted that the primary difference between the two is the fact that the TDS deducted on Salary is reflected in Form 16, whereas the TDS Deducted on Other Payments is reflected in Form 16A. Additionally, Form 16 is generally issued annually whereas Form 16A is issued quarterly. Everything but the salary, such as professional fees, rent, bank interest payments, etc. Personal details of the employee including name, Permanent Account Number (PAN) etc. Employer details including name, permanent account number PAN, TAN etc. Details of salary including gross salary, net salary, perquisites, deductions etc. Details of tax payment including cheque number, DD number, voucher number, challan number etc. Personal details of the person paying the tax including name, Permanent Account Number (PAN) etc. Details of the one deducting the tax including name, permanent account number PAN, TAN etc. Thanks for the sharing such an informative post.